New model 2018, the JPX6 combines the outstanding features of the JPX2 with the powerful design and higher load capacity of the JPX4 : a light and compact pistol that shoots 4 irritant liquid cartridges. With of course the well known sophisticated technology, the efficiency and the easy use of thei personal or professional defence weapon. The Jet Defender Piexon JPX6 is a rechargeable defence weapon, extremely efficient. It shoots an irritant liquid at a very high speed, what gives it a high stopping power that will instantly block the agressor. The loader holds 4 cartridges (non-separable), just slips over the barrel. 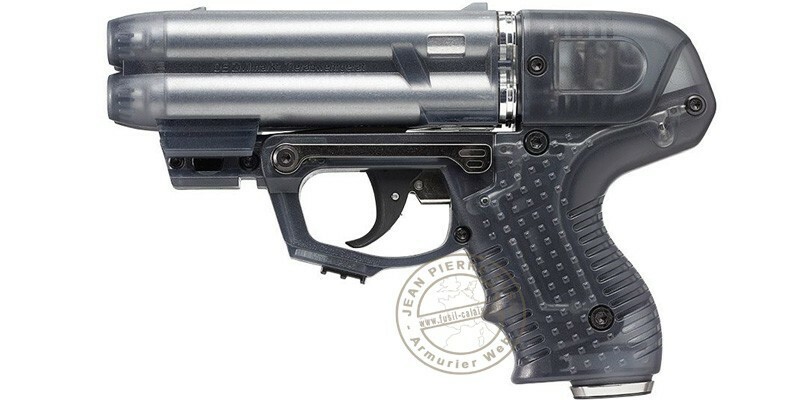 The pistol is thus ready to shoot, and can stay before being used. The trigger has an integrated shifting systems that automatically swithces from one firing pin to the next. The symptoms resolves within approx 45 min, and generally without any lasting effects.